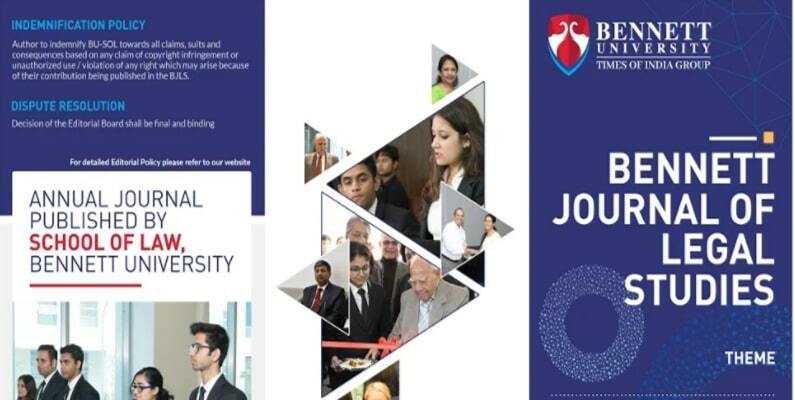 Bennett Journal of Legal Studies (BJLS) is an annual journal proposed to be published by the School of Law, Bennett University, Greater Noida. The journal seeks to serve as an interdisciplinary forum for examining socio-legal issues from contemporary perspectives. The Journal is currently soliciting submissions for its flagship journal, Volume – I (February 2019). The theme for the Issue: Changing Dynamics in Constitutional Interpretation. Long Article: Papers amounting to Long Articles must be between 5000 and 8000 words (exclusive of footnotes) and must engage in comprehensive analysis of the chosen issue, its status quo, any identifiable lacunae, well-examined literature available in that area and an original view or original assessment of that issue. Short Article/Essay: This category of papers must be concise (both in scope and conceptualization) and deal with more specific issue, making an easily discernible, concrete and articulate argument. It can also be used to challenge existing paradigms/norms and provide fresh outlook to common problems. It should be within 3500 to 5000 words (exclusive of footnotes). Case Comment, Legislation Review or Treaty Appraisal: Papers in this category are expected to undertake an original and critical analysis of important judicial decisions (preferably recent), legislation or treaties falling within the broad theme. It should be within 2000 to 3500 words (exclusive of footnotes). Commentary, Book Review or Short Notes on Contemporary Developments: Brief Commentary, Book Review or Short Notes relevant to subject matter of journal are invited, preferably within 1500 to 2000 words (exclusive of footnotes). This category includes critical reviews of recent developments in law or policy, books, articles, or even movies. •	All submissions must be the original and unpublished works of the author. •	The contributions shall be evaluated on the basis of originality, innovativeness, clarity and technical correctness. •	All submissions to be made online to jls@bennett.edu.in the Last date for receiving contribution is 30th January 2019.